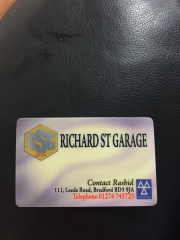 Richard Street Garage situated on Leeds Road, Bradford, provides efficient, value-for-money servicing for all makes and models of cars and light vans in the Bradford, Shipley and Leeds area. We are also an MOT Testing Station.Established in 1970, we have expert engineers and computerised equipment to provide our customers with a high standard of service. We sell new and part worn tyres and use digital balancing and laser tracking equipment.Richard Street Garage, Bradford, undertake all engine repairs and rebuilds, and use the latest diagnostic equipment. We provide a fast turnaround service for all our customers and are pleased to offer a discount service for taxi customers. Very pleased indeed. Communication was excellent and all the work was documented on the website. The car was picked up and dropped off so didn't have to worry about a thing. All the work was talked through at the end and my car was even given a complimentary wash! Highly recommended- would definitely use again. since the repairs on my car there is a whining sound coming from either the replaced brake pad or disc when I drive slowly.....it was minimal at first so i thought it will go away but now its laud. Rash was on time and very polite. My new clutch was fitted and car returned in a few hours. I highly recommend RSG and will definitely be using them again in the future. Rash was very friendly and polite, kept me informed when traffic held him up, additional problem found when clutch removed, reasonable addition to the bill. Rash was great, explains what was going to happen and is certainly a guy who you can trust. Very knowledgeable and very good communication. And fast and easy. Would use them again. I went to work, came home and my car was done. It couldn't have been simpler. I did have a question about the work- and the garage was incredibly helpful and could provide me with the information I needed quickly and efficiently. I will be using them again. Great job by Rash. Called before picking up / dropping off car and arrived when he said he would. Made sure I knew to check coolant level after engine had cooled down. Very competitive price for timing belt / water pump change and sent photos of old parts and new fitted parts. Would use them again and definitely recommend them. Very happy with the work carried out. Mechanic seemed very knowledgeable. Rasheed was a pleasure to deal with. He rang me when on route to pick my car up and returned it quicker than expected. Would recommend to friends and family!